Is poker becoming a woman’s game? - BeatOnlineCasino.net - Is poker becoming a woman’s game? Is poker becoming a woman’s game? All the poker player names that come to mind used to be male ones, but today, there are more and more women players taking the biggest prizes in the world of poker. Only last Sunday, British player Victoria Coren Mitchell made poker history when she won the European Poker Tour for the second time. She first won the tournament back in 2006 and with the win on Sunday she became the first two-time winner of the event. To claim her victory, Coren Mitchell beat off competition from 556 other entrants and walked away with a cash prize of almost £400,000. The weekend’s win means that Coren Mitchell has won more than £1.5m in poker tournaments to date, and that puts her in the top ten of female poker players when measured by earnings. Poker is not a full-time occupation for Coren Mitchell – she is also presenter of the BBC Four quiz show Only Connect. Coren Mitchell isn’t a lone female at the top of the poker rankings either. The biggest female name in poker today has to be Vanessa Selbst, who has earned an impressive £9.6 million through playing live tournaments. She is sponsored by PokerStars and her biggest win to date was the $1.8m that she won at the Partouche Poker Tour in France. She started 2014 with a win of $760,640 at the PCA Super High Roller and is currently ranked seventh in the Global Poker Index (GPI). Of course, though a few women are taking the top prizes in live poker tournaments, if you look at the stats, women are still very much in the minority when it comes to participating in these kinds of events. They don’t take up even 10% of the tournament places or cash game seats around the world. But those who are there are doing well. 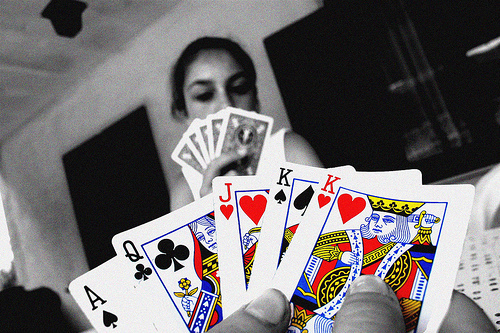 What could be giving women the edge when it comes to high stakes poker? The online game has definitely helped make poker a game that both sexes can play. Whereas a few decades ago, there might have been a ‘man’s world’ feel to a poker room, when women can test out their poker skills at an online casino like 32red before they enter live tournaments, it’s a great way to build up confidence. Also there’s a whole societal shift that makes the old idea of poker games being male-only territory a bit of an anachronism. Added to the fact that there are so many more women playing poker, some people suggest that women are better at sitting down and getting to understand the rules before they rush into making unwise bets. Others say that women are better at knowing when to quit than men rather than let their egos get the better of them, and going all-in when their cards aren’t good enough. These are only theories, of course, and luck has to have a lot to do with any player’s game. One thing’s for sure, though; we’re likely to see the game of poker becoming even more of a level playing field between men and women in future years.